I bought this shirt back in the Summer, and have been wearing it a lot lately. 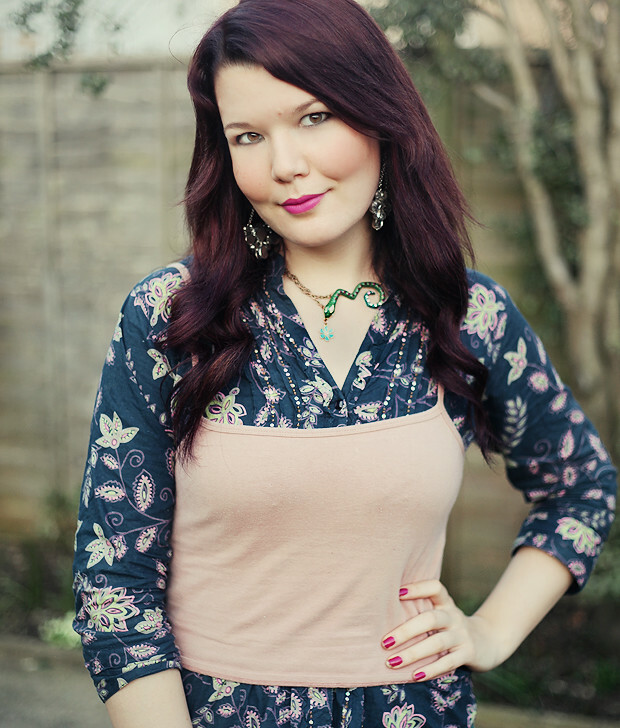 Now the weather’s warmer, I can justify wearing a half-see through shirt – up until now its simply been far too cold, and I wouldn’t want to hide it under a big jumper because its one of my favourite items at the moment. You’ll be seeing a lot more of it this summer, for sure! I’m so excited to be back in Somerset in a couple of months, where I’ll be moving in with two of my best friends (I’m very excited about this!) and will be converting my old room in my parents’ house into my Cherry Humbug office – my room is a little bit chaotic at the moment, it has truly been taken over by all of my stock! 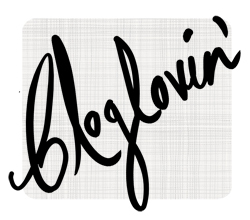 Its worth it though, I’m really enjoying sourcing fun jewellery for you all to enjoy! P.S Shout out to my housemate Gemma, since it was her turn to get roped into taking these pictures for me; and a very good job she did too… thanks Gem if you’re reading this! I’ve been wanting to do video posts for a while now, but didn’t really want to use Photo Booth because the picture is so grainy; so now I have the video recording facility on my new camera, here I am! I’m finding this a bit cringey to be honest, but I just need to get used to it… hearing and seeing yourself speak is so horribe, isn’t it? Haha. I also hope no one will find my Somersetty accent annoying, because I’ve been told before that it is… by one of my friends! (Thanks!) I can’t really hear it myself, so I wouldn’t know how to get rid of it if I could! But anyway! 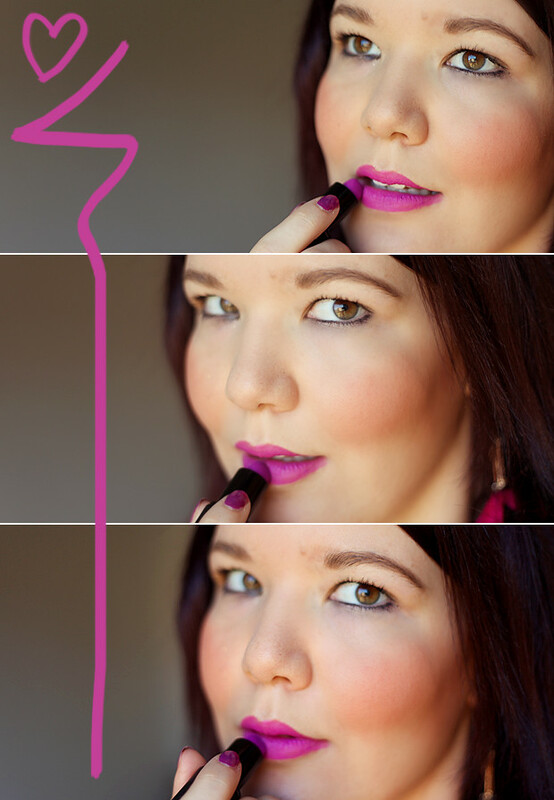 Sleek Make Up is a brand I really believe in, and I really enjoy the lipsticks I have, and wanted to pass on my recommendation because I’m a firm believer in good value for money – and Sleek totally fit the bill in that respect, as far as I’m concerned! 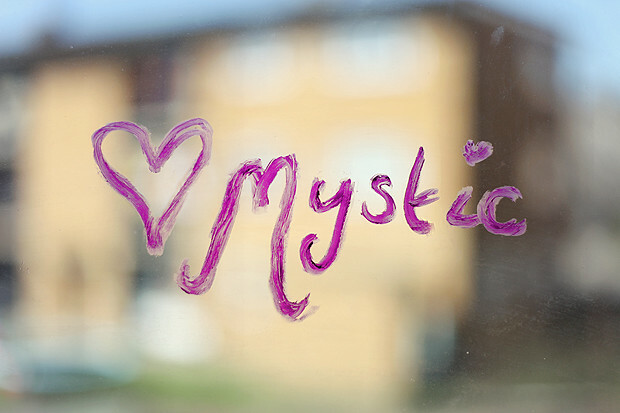 P.S I hope no one will snitch on me to my landlord for doodling on the window with lipstick! Sorry Mrs Rafferty…! 01. I’m a big fan of Swedish Hasbeens, and when I saw these on ASOS they reminded me quite a lot of some of the designs I’ve seen before. These are pefectly chunky, as well as being in a great blush red that I think would look great with a little summer dress and some matching lipstick! I also really love the cutout detail, and because of the platform they probably wouldn’t be too uncomfortable. I’m a big fan of redesigned clogs, and these are pretty much the ideal as far as I’m concerned! 02. 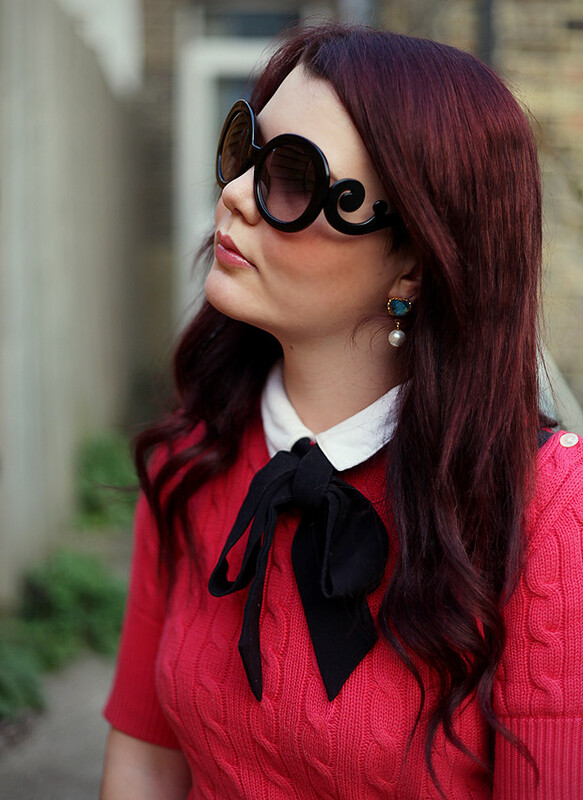 I really love a cute collar, but unfortunately since they became a ‘thing’, they’re two a penny on the high street and every other person seems to be wearing one at the moment. I’m a bit reluctant to buy peter pan collared shirts now because they don’t have that novelty appeal that they used to, so this would be the perfect solution to this; it would allow me to collar up my existing clothes, which would keep the look unique and a bit more fresh! 03. 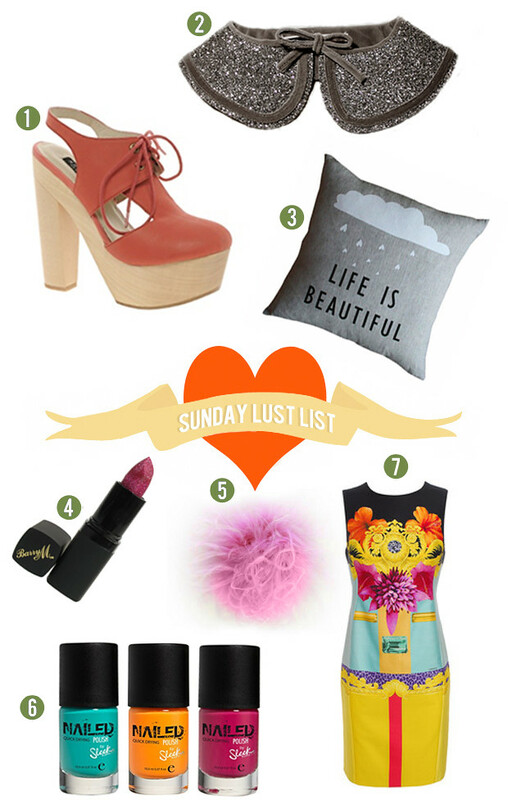 I spotted this cute little cushion on Gem’s blog, and simply had to put it on my lust list. 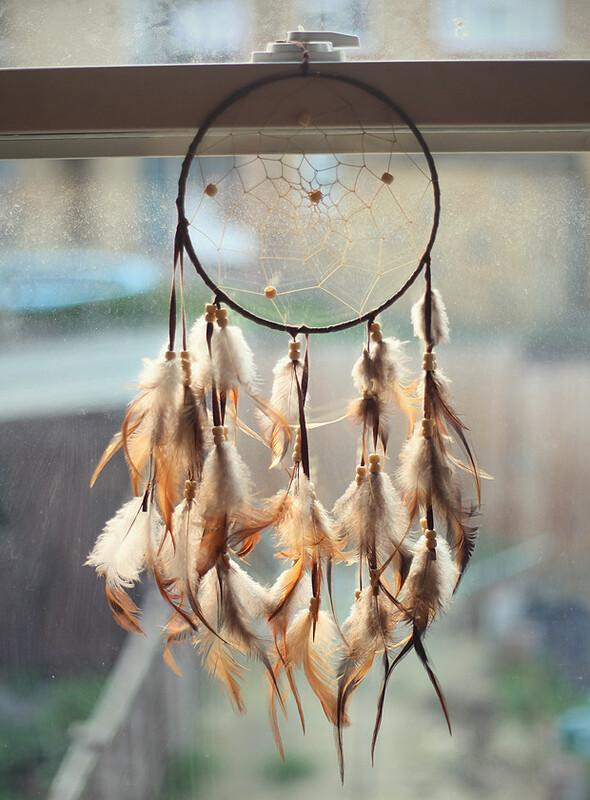 I’m not sure where its from, but I love decorative items like this because they’re great for adding an air of eclecticism to a room – and positive thinking is the way forward, people! 06. That dress, plus these coloured nails = a match made in heaven, don’t you think?! 06. And now, the holy grail. This dress is truly eye-poppingly epic! I would love to take this Versace creation for a spin at a cocktail party, its to die for… something tells me I won’t be having the funds to buy it anytime soon, but a girl can dream, right? B-E-A-U-tiful. 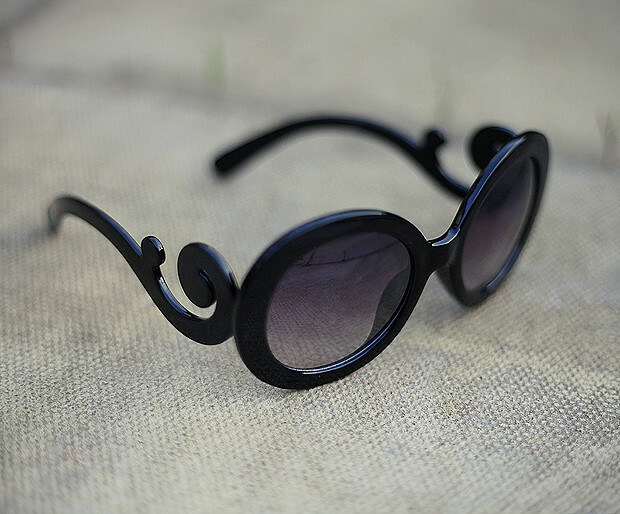 For those of you who have been following Cherry Humbug for a while, you might remember that I put the Prada Baroque Sunglasses on this Sunday Lust List last July. I’m afraid my craving for them never quite went away, and with Summer on its way again, and with all of my other sunglasses broken or lost, I felt it was time to indulge myself in their amazingness! Speaking of Prada, one of my friends compared this River Island skirt to some of the designs from the Spring/Summer 2011 collection; the same that the sunglasses came from. I suppose without realising it, I’m becoming quite the Prada fan! There have been a couple of pieces on my Lust Lists from both Prada and Miu Miu, so I’m guessing Ms Miuccia’s creations are really hitting my buttons at the moment – now all I need to do is win the lottery… shouldn’t be too hard, right?! Today hasn’t been all that eventful, I had a couple of parcels to pick up from the Post Office (one ties in with the tutorial I’ll be doing soon!) and have just been running other errands and settling back in at my uni house. So not much to report on! The weather has been a joy, as you can probably tell because for once I’m not wearing tights or jeans – woohoo! Fingers crossed that it’ll last, everyone! 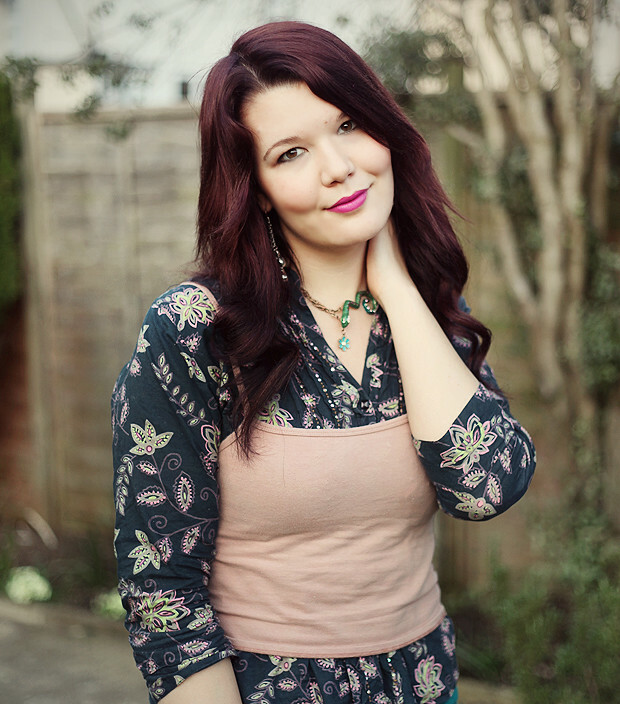 I wasn’t planning on doing an outfit post today, but my friend Charlie came round in time to catch the light so I got her to take a couple of snaps for me on the new camera! I can’t wait to be reunited with my remote control so I can take my outfit post photos myself easily – I’m going back to Rochester tomorrow so its all good : ) I’m hoping to train up my mum and my soon-to-be housemates so I can have some help with photo taking, it can be really hard sometimes trying to do it myself and I never seem to get the results I hope for, so with any luck that’ll change soon! This shirt was a Christmas present about 4 years ago. When I was little I used to have little Paisley handkerchiefs, so my mum bought me the shirt for nostalgic reasons. I still get a good amount of wear out of it even now, which is good – I’m not too fussed about whether something is ‘in’ fashion or not, as long as I like it, its all good! P.S the light/lack of shadow makes it look like I Photoshopped the snake necklace on afterwards… this isn’t the case, weird! Haha oh dear. I know I’ve already done a post today, but I figured that if I have the content, I may as well post it up! This post is a bit of a testament to what I’ve been saying about my camera upgrade; there’s a stark difference between using the 400D with the kit lens, and the 5D Mk II with my 50mm lens! Like I said last post, I’m currently remote control-less at the moment, and have to use my wide lens on the 400D for outfit posts, and I’m using the 5D for any other shots that I can hand-hold. 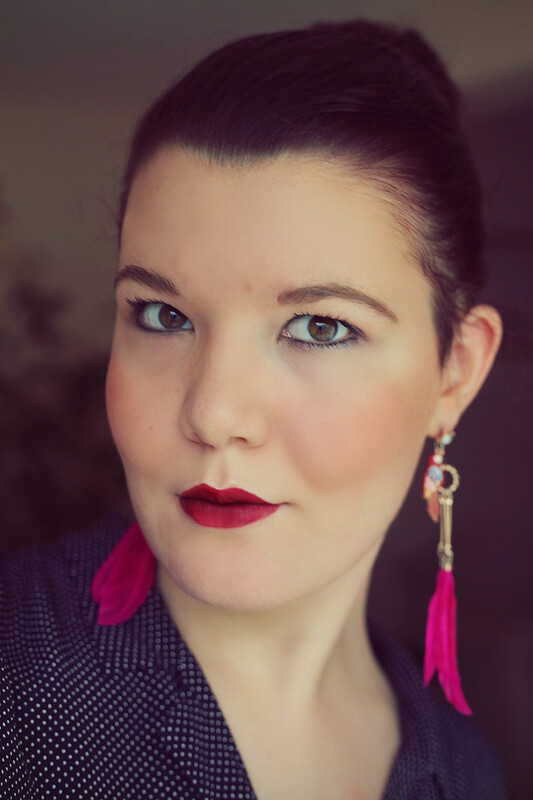 No matter how long you’ve been visiting my blog, you may have never seen me with my hair up – but alas, it happened today! I feel a bit bare but as they say, a change is as good as a rest, right? As you may have noticed, I’m wearing polka dots again… what can I say?! I’m also wearing my parrot earrings which you’re probably fed up of seeing by now! I’m trying to be good with my CherryHumbug.com stock and not keep too much of it for myself – so far I’ve kept one necklace, one pair of earrings and three rings for myself, which is quite good given that I’m easily tempted, especially where jewellery is concerned! Haha. I got this shirt from a charity shop, for a really good price. Its not my size, but I find that I’m quite lenient when it comes to that kind of thing, and oversized charity-shop-found shirts are fast becoming a wardrobe staple of mine! The skirt is one I got years ago from Next, and the boots are the Emma Cook for Topshop 2009 boots that I’m determined to get some more wear out of/wear them enough that they become comfortable. The problem is with my university campus, is that its up a reallly steep hill, so I rarely (if ever…) wear heels when I’m in Rochester. Also, strangely, the pavements seem to have some kind of slopey-ness going on around the Rochester area, which means 90% of the time when I’m wearing any kind of heels, I’m aware of the fact that I’m probably going to fall over and break my neck! Not cool. If you haven’t seen Bug before, here he is! He’s become quite accustomed to having his photo taken since he’s my favourite subject… and I’m quite sure now that he even has a few poses he likes to do when the camera comes out! 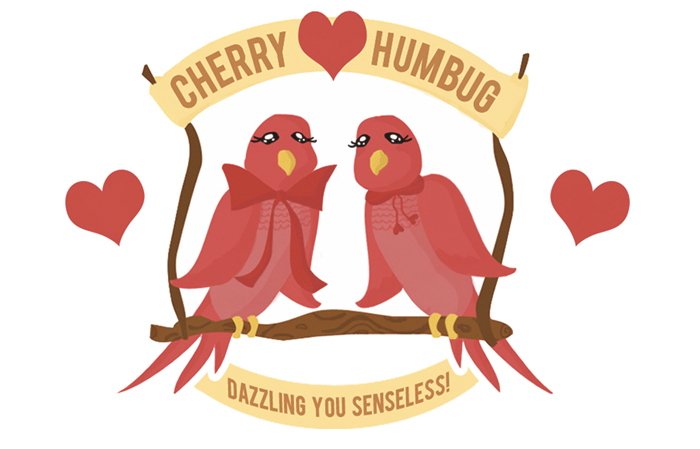 A little fun fact for you is that Bug helped inspire the name ‘Cherry Humbug’ when I first started my blog! 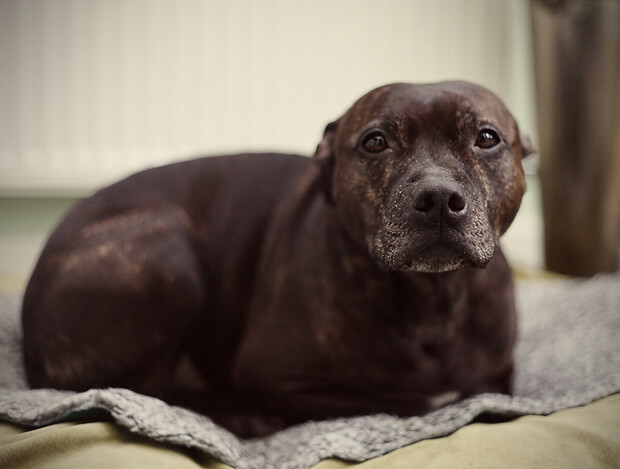 By the way, if like other people, you’re tempted to ask me why on earth we’d call a dog ‘Bug’, we got him already-named from a rescue centre, so you’ll have to forgive me that one… I think it rather suits him, he’s a funny little thing! After reading about this amazing Latvian brand Qoo Qoo on Fiona’s blog, Save Our Shoes, I simply had to check out the website to get a taste for more of their ethereal yet funky creations. Having always been fascinated by the sea, and the creatures that live in it (you can probably put that down to the fact I watched The Little Mermaid about 3000 times throughout my childhood…) these underwater and aquarium inspired dresses are right up my street! The graphic prints are done in a way which is both really cute and also a little bit off the wall – perfect! Check out those seals, they look a teensy bit piggy-faced to me; I absolutely love them! 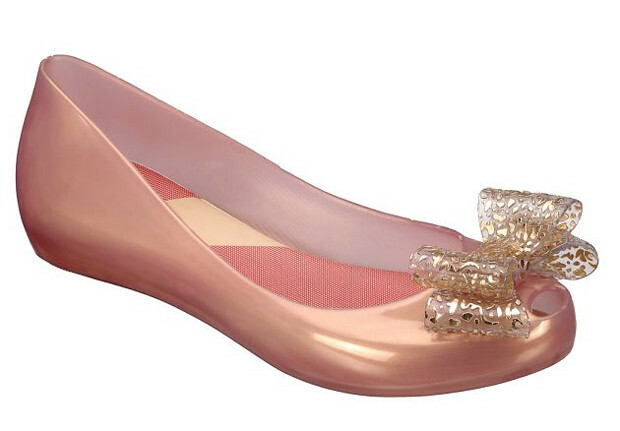 I’m also pretty obsessed with these Ultragirl Pink Bow jelly flats by Melissa, and think they’d look amazing paired up with any one of these dresses. The other option would be to wear some really aggressive shoe boots with them, along with some opaque white tights, wouldn’t that look great? Anyway, speaking of jelly shoes (again) anyone would think I was having a quarter life crisis, right?? I can assure you that I’m not, and that I’m simply going through a bit of a ‘pink and fluffy’ phase at the moment, and that these to me are pretty much the modern equivalent of the Cinderella shoe – with an edge, of course. Vivienne Westwood can me my fairy rock-mother any day of the week, for that matter! Melissa shoes are definitely rocking my world at the moment, I can’t get enough of those delectable candy shades which would be perfect for the summer, yummy!